Mazie Hirono was born on November 3, 1947, in Fukushima, Japan. When she was almost eight years old, she and her siblings were brought to Hawaii by their mother, who was trying to escape an abusive husband. In 1970, Hirono earned a bachelor’s degree in psychology from the University of Hawaii at Manoa (UHM), where she had participated in a number of anti-Vietnam War protests and experienced what she would later characterize as a “political awakening.” Also during her college years, Hirono read Betty Friedan‘s The Feminine Mystique, which she credits as having been “the most influential” book to which she was exposed as a student. After earning a JD at Georgetown Law School in 1978, Hirono took a job in the antitrust division of the Hawaii attorney general’s office. In 1980 she ran successfully for a seat in the Hawaii House of Representatives — a post she held until 1994, the year she was elected as the state’s lieutenant governor. In 2002, Hirono ran for governor of Hawaii but was defeated by Republican Linda Lingle. Two years later, Hirono founded the Patsy T. Mink Political Action Committee, named after the first nonwhite minority woman ever elected to Congress (1965). This PAC’s mission is to help elect “progressive pro-choice Democratic women” to public office in the state of Hawaii. In 2006 the voters of Hawaii’s Second Congressional District elected Hirono to the U.S. House of Representatives, where she promptly joined the Congressional Progressive Caucus. Six years after that, Hirono became the first Asian-American woman ever elected to the U.S. Senate, where she has occupied seats on several powerful committees and subcommittees, including the Armed Services Committee, the Committee on Veterans’ Affairs, the Senate Judiciary Committee, the Committee on Energy and Natural Resources, the Subcommittee on Seapower, and the Subcommittee on the Constitution. In October 2017, Hirono denounced President Trump’s decision to decertify the Joint Comprehensive Plan Of Action (JCPOA) — a 2015 accord whereby the Obama administration (and the governments of five other nations) had agreed to allow the Islamist regime in Tehran to enrich uranium, build advanced centrifuges, purchase ballistic missiles, fund terrorism, and be guaranteed of a near-zero breakout time to the construction of a nuclear bomb approximately a decade down the road. “In making the dangerous, political decision to decertify Iran’s compliance with the agreement, Donald Trump is jeopardizing our national security by undermining the harsh restrictions on Iran’s nuclear program established by JCPOA,” Hirono stated. 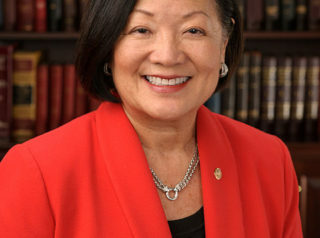 In December 2018, Hirono joined fellow Senator Kamala Harris in challenging President Trump’s nomination of Brian Buescher to the U.S. District Court for Nebraska because the judge belonged to the Knights Of Columbus (KOC), the world’s largest Catholic fraternal organization, which the two lawmakers characterized as an “extreme” entity. The senators’ bone of contention was the fact that KOC affirms traditional Catholic teaching on issues such as marriage, sexuality, and abortion. Both senators pressured Buescher to resign from KOC. Hirono, for her part, claimed that KOC’s “extreme positions” should oblige Buescher to recuse himself from any case in which the aforementioned issues were involved. For an overview of Hirono’s voting record on an array of key issues, click here. For additional information on Mazie Hirono, click here. Further Reading: Hirono Biographies (Hirono.senate.gov, Votesmart.org); “Hirono: Ending DACA Is Latest Step President Has Taken to Attack Minority Communities” (9-5-2017); “Hirono: Trump Decision to Decertify Iran Nuclear Deal Is ‘Dangerous, Political’” (10-13-2017); “Senate Dem Mazie Hirono Calls on Trump to Resign” (The Hill, 12-12-2017); “Dem Senator: Trump ‘Made Clear’ He Wants ‘White People to Come to Our Country’” (Newsmax, 1-16-2018); “Transcript: Russian Investigations” (5-22-2018); “Dem. Senator Cries ‘White Supremacy’ When Asked About Harassment of GOP Senators” (PJ Media, 8-8-2018); “These Two Democratic Senators Are Waging a Bigoted Campaign Against Catholics” (NY Post, 1-29-2018).